We must note at the beginning that none of the members of the committee are Master Gardeners. However, we all have a varied number of years gardening here and other places, have talked with longtime gardeners, and, of course, have been on the internet with frequency looking for answers to gardening problems. Over the past few years untended gardens were allowed to go to weeds. This, of course, means that the weeds were allowed to reseed and proliferate. As a result, weeds are a problem in our gardens. There are a few things we would like to suggest that will help keep them under control. Shortly after planting, weed the garden thoroughly. 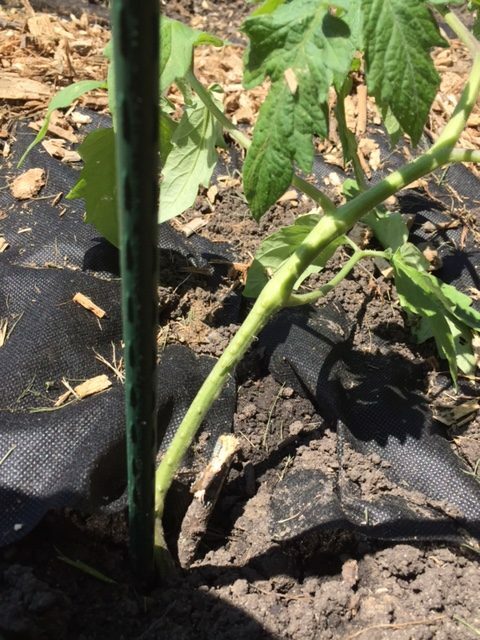 Then put down either garden “cloth” or single sheets of newspaper covered with around 2 inches of mulch, straw, or grass cuttings and water thoroughly. Of the options, we personally prefer newspaper because it biodegrades easily and, for that matter, is much less expensive. Grass is better than mulch/straw because it also degrades rapidly and can be easily tilled in the following year. However, it has to be hauled in and only should be used after the third mowing if a lawn has been treated. If you use Weed Guard, it needs to be removed at the end of the year. There will be weeds growing into the gardens from the pathways. The most difficult weeds to control are those that grow under and into fences that can’t be reached by the mower. The best way to handle this seems to be to put the fence about two inches into the tilled area on all sides and then, with a hoe, make a trench two inches wide and deep—rather like what is done in England. Because the trench is carved out of tilled soil, this is easily done. What the trench does is allow mowing up to the fence, cutting down the weeds before they can migrate into the garden. In any event, while these actions will not eliminate the weeds, they will make later weeding a lot easier and keep the gardens cleaner. Tomatoes have had a problem because of what looks like (has not been officially diagnosed) a fungal wilt. Whatever it is, everyone’s tomato plants started with yellowing leaves at the bottom which moved up the plants. The plants survived the whole season, but the production was less than with a completely healthy plant. Some of us were able to hold off the disease by planting tomatoes labeled VF or VFN(fusarium/verticillium/nematode) resistant. 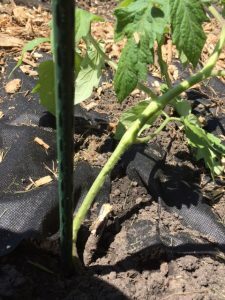 That, along with mulching to prevent rain splashing soil on the leaves and periodically spraying the plants with neem oil, seemed to allow for at least a decent production of tomatoes. The only other thing that some gardeners say one can do is dig a much larger hole for the tomatoes and add bagged garden soil. No one has tried that, so who knows. There was an infestation of squash bugs last year to the point where everyone lost, most particularly, all their squash and melon plants. While there are manual ways to go after them, such as hand picking and destroying eggs before they hatch, this is the most tedious job one can imagine. As such, for this year we have decided to allow the application of Sevin. If you are growing squash and/or melons, get some and apply as recommended. Finally, for other fungal and insect issues (such as cabbage moths), neem oil is the “go to” spray for organic gardeners. Probably not as effective as chemicals, but it works and it is by far better for the environment and for us as a part of that environment. Here’s a couple of tips just in from our gardeners this year. C.W. had concerns about a nitrogen deficit in the soil and recommends adding blood meal if you see early yellowing of your plants and seedlings. If you are adding a plant fertilizer, check to see how much nitrogen it contains. Two new tips as the summer progresses. Squash bugs have appeared. While Sevin dust is being allowed this year, some folks don’t like to use it. C.W. suggests using diatomaceous earth which is also a dust but considered totally organic. You can sprinkle it around and on vulnerable plants to kill or deter insects. Neem Oil is also useful with insects.